After thinking about your new kitchen for some time, you’re taking action. No doubt you’ve made lists and neatly clipped all those pictures that caught your eye. Decide on a list of elements you simply must have and those that would be nice to have if space and budget permit. Focus on the functional aspects of the room, and be realistic. How often you entertain, cooking habits, children and other elements of your life should determine what kind of layout and options make the most sense. If this is a renovation, a sketch of your room with accurate measurements is a critical step in receiving an accurate quote. If you choose our installation service our professionals will come and measure your space before any cabinetry is ordered to verify accuracy. Draw a rough sketch of your room on a piece of paper and include your measurements. Measure openings (doors & windows) from outside trim edge to outside trim edge. Measure the full length of all walls. Check length at 2 elevations, the ceiling and the floor. Use the smallest dimension. Measure the wall in segments. Start in the left corner and measure to the outside edge of the first opening, such as a door or window. Measure across the opening from outside trim edge to outside trim edge. Measure from outside trim edge to the next opening, or to the far wall. Check your overall dimensions: your measurements should equal the overall wall measurement. Ceiling heights, even in the same room, can vary. Measure ceiling height in three places throughout the room. Warning: Soffits typically contain electrical and plumbing elements that can’t be relocated. Consult a professional on your remodel. A soffit, also called a bulkhead, is the area between the top of wall cabinet and the ceiling. If your room includes a soffit, this dimension should be marked on your sketch. Appliance dimensions are critical to the overall fit of all kitchen components. Whether you are buying new appliances or using existing ones, provide the dimensions for each appliance in your kitchen. Door hinges and handles can obstruct surrounding cabinets and must be factored into the design. Whenever possible, provide manufacturer spec sheets for appliances. Manufacturer Spec Sheets are installation guides that list the dimensions of the appliance. Your choice of door style, wood species and finish will have the greatest impact on the overall feel of your new kitchen. Our 2000 sq.ft. showroom is full of ideas and selection so that you can plan the kitchen of your dreams. 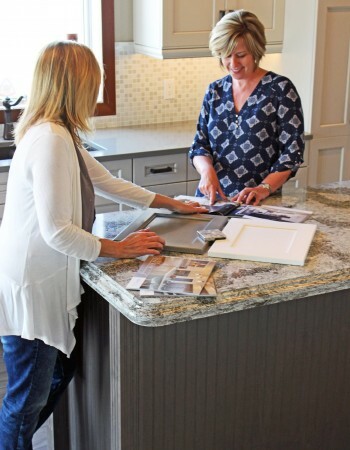 Bring your sketch or house plan into the showroom and our sales associates will walk you through this process from picking out materials and accessories to designing a layout that makes sense for you and your family. Trust our professionals to take you through the final stretch. Using the information you supplied and the selections you made, our sales associates will provide you with a free drawing and quote. Don’t be afraid to talk with your sales associate to re-work drawing if need be. We want your kitchen to be perfect! Once you have made the decision to order your cabinetry from us, make an appointment with your sales associate to go over details. He/she will review your selections, drawings & measurements with you so that you can feel secure that you are getting exactly what you want – a kitchen you will love! If you have chosen our installation service, our sales associates will come to your home to verify measurements. Cabinets will only be ordered once measurements are verified. If you are installing your own cabinets, you will need to verify all measurements before cabinets are ordered.